Just got it and I love it !! Make litter cleanup less of a hassle with this spinner-style litter box. The soiled litter collects in the underneath basket for simple, convenient disposal, and this box design works nicely in small homes or areas with limited space. Cats up to 15 pounds can fit comfortably into this litter box, which is made from lightweight yet durable polypropylene. This item was so easy to assemble. Chloe has made the change to her new litter box with no problems. She is about 10 pounds and has no trouble getting into the spinner. Wish I had this with my first cat. Cleanup is a snap. Takes less than 5 minutes from beginning to end. I love my Litter Spinner. I usually don't post reviews on products but I am very impressed with this product. I can't believe I scooped a litter tray for so long before I found the litter spinner. I really can't think of anything I don't like about it. It is simple to use, looks way better than any other litter box i've owned, and since its quick and simple to clean I do it more often so there is virtually no litter box odor. This is the best litter box I have ever used. I now have me third set of cats. In the past I have used open regular litter boxes, permate covered litter boxes, even booda covered litter boxes and they have all leaked. With the litter spinner there isn't any leakage. To clean it all you do is spin and empty the pull out basket. Cleaning the litter is no longer a chore. I love this litter box. When I need to wash the litter box I just unscrew the two halves and wash, then screw it back together and I am set to go. The best litter box ever. Great quality product. Every cat owner should have one. I'm not sure about the review complaining of litter mess, I have had no problems in that area. Every once in a while a piece of litter may come out that I figure was stuck in my cats foot, but I also purchased a litter mat that picks it up when my cat exits. It is really not a problem for me. I did a lot of research before purchasing this because it was more expensive then your every day litter box and i wanted to make sure i wasnt wasting my money. 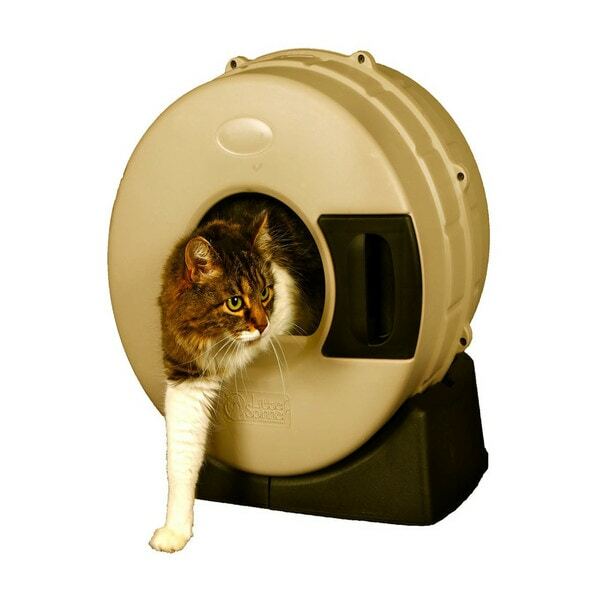 This litter box takes up no more space then your average dome litter box and is super easy to use! I made the mistake of putting to much litter in it so make sure you dont over fill it or it wont all sift when you spin it. I read a few complaints that when people pull the drawer out to empty it after spinning that litter dumps on the floor but if you follow the instructions and tap the drawer a few times after spinning then pretty much nothing falls out. It is super easy to put together and is made of VERY thick and durable plastic. I took my old one out and put this one in with new litter and a few scoops of what was in there litter box (just to make sure they knew to use it b/c it looks way different) and they took to it right away. The only thing i will say as a negative (not for me but may be for others) is that if you have larger cats then it probably wont be to comfortable for them...doesnt seem to be made for larger cats. Luckly both my kitties are on the small side. To the person on here who complained about spinning it and litter spilling out and pulling the drawer out and litter falling out....idk what you did wrong but i dont have that problem at all. Even when it was over filled and i spun it none fell out...it just didnt sift all of it. After i took some of the litter out and spun again i smacked the drawer once and pulled it out and no litter at all fell out. I have used it several times since setting it up with no issues. Unless you are spinning it like a tornado or WAY overfilled it then idk what you may have done wrong. Great idea, and well executed. I've had this 'spinning kitty' litter box for a couple of weeks so far and I have nothing but good things to say about it. Cleaning the litter takes about 30 seconds, and a handy flip-top trash can next to the litter box makes disposal even easier. I appreciate how well the heavy construction stands up to the occasional banging on it to dislodge serious clumps. (I haven't used the included scraper yet because hitting the outside works so well.) We have 4 cats and this was to be our overflow litter box. But all have shown a preference for it. I'm thinking about replacing our original conventional tray litter box with a second spinner, but we need to think about where to put it. The manual operation requirements a lot of room to access it on the top and side, so it won't fit in the little kitty closet we've been using. Oh yeah, I haven't had to use this feature yet, but I really like the idea of a drain plug in the back for when I'll eventually need to wash the box. So far this isn't a problem, but I suspect within a few months I'll want to hose the thing down to get it really clean again. I stumbled upon this box when researching which automatic box to get for my cat. The fact that this box doesn't rake the litter on it's own doesn't matter since the inferred convenience of that is cancelled out by the fact that this box is so easy to use a child can (and my 11 yr old has) empty it, it is cheaper to purchase and maintain than an automatic box, it can use any kind of clumping litter you desire, and you also don't need any special liners or bags for it. One thing i considered when deciding to buy this box was that my cat doesn't always cover his poo...the thought of cleaning the rakes from those automatic boxes when that happened did not make me happy. And I know that comes up because one of the automatic box manufaturers even has you buy and spray this non stick stuff on the rakes. But since you spin the box around before it comes into contact with the rakes all the pee and poo gets covered and clumped up so that never happens. You also never have to competely empty this box...just keep adding fresh litter, although there is a drain plug on the back if you need to empty it, say if you were moving or something. I couldn't rate it a total 5 stars because it is not that big and if you have a bigger cat they may not like it. Mine sometimes goes in and will pop his head out when doing his bussiness and pop his back end out when covering the poo with his front paws, but he can also fit inside and do all that in there as well. As for cleaning it, I just keep a box of small garbage bags next to it and pull out the drawer and empty it into that, tie that up and in the garbage it goes. So freakin easy! My other complaint would be that sometimes when I empty it some of the litter comes out on the floor, even though I smack it vigorously after spinning it and before pulling the drawer out. But I just keep it on a small carpet like what you might put in front of you sink and the litter usually stays contained on that. Hit that with the vacuum when I clean and shazzam! I do have to say that even though the design is clever and the fact that it comes in so many color choices and doesn't even really look like a litter box (looks pretty cool actually) it still seems kind of expensive. But the money I have already saved in not paying for special bags, liners, or litter has already made it worth it to me. I say go for it people and happy peeing and pooing to cats everywhere! I love my new litter box especially since I moved into a three room apartment! It is so convenient and I no longer have any smells that I wish would vacate! I also have used way less cat litter since I purchased this product and it even looks cute with my new litter genie! The white and gray definitely match! I can't say enough nice things about the Litter Spinner. It makes keeping the litter fresh for my six cats so much easier and has allowed me to go from four standard litter pans previously to just 2 Litter Spinners, since it takes less than 30 seconds to clean them. I clean them 3 or 4 times a day, it's so simple. They also look much more stylish and attractive than big clunky litter boxes, so they don't clash with my decor like the old ones did. I had looked into electronic automatic litter boxes but after reading so many reviews from people saying that they failed after only a few months, I didn't want to risk that happening after spending so much money. Thankfully I found this product instead. No electrical parts to potentially fail in a few months and I was able to purchase two Litter Spinners for less than the cost of just one of the automatic litter boxes. I'd also like to give a shout out to Overstock.com customer care for being so helpful after only one of my Litter Spinners arrived the first time around, and quickly sending me a replacement with no charge. Works great, exactly as described. Very easy to maintain and clean. The gray and white spinner looks nice in our guest bathroom. Our cats are a very large size and still growing (18 months old). Due to the tight fit, i think that they tend to prefer our other litter boxes over this one. They both use the litter box, but not very often. I gave it a five because it is the mechanics of our large breed that made it less functional for us. The litter box works great. The only reason I didn't give this a 5 is because it is not as sturdy as I had hoped. But it works! Its so easy. No more using a scoop that no matter how hard you try, spills litter all over the place. Just pull out the tray and pour into a bag. I am waiting to buy another one. Just got two kittens and I feel its worth the investment. They hold much less litter so you need to spin and dump it maybe once every day or two for two cats. It's very easy though, so it's not an inconvenience to empty it so often. I had one of those automatic litter boxes before and I tossed it out when I got this one. This makes more of a mess than my original basic box. I followed all of the instructions, but when spinning (very slowly), a big pile of litter falls out. I put less than recommended, but still removed some of the litter to see if that helped. Still a big pile of litter falls out. I spun 3x really slowly and still the waste did not fall in to the removable basket. Litter continuously falling out, even when filled to manufacturer's spec. Kitty boy is 16 years old and dealing with an overactive thyroid and now probably kidney failure He's had a few 'accidents' - mostly in the same exact area of our living-room. Yes, I've cleaned the rug there, repeatedly...… Anyway, we got this box and set it up on the spot he'd been 'irrigating' - and the next day he investigated it and used it. The box is easy to clean - I'd suggest putting a plastic bag under/around the door as you go to open it to prevent spills. Don't know how easy it will be to wash this one - but it was very easy to assemble. My only concern about it is the color - I think the gray one is pretty dark inside and I wonder if that would make it less attractive to older cats or ones with poor vision. Kitty boy is very thin now, but in his prime he was about 14 pounds of lean furry love. He's so scrawny now it makes me cry, but he's still as long and as tall as ever. So this box will be big enough for a pretty large cat to comfortable make use of. It was hard for my cats to use it, I have 2 big ones and they didnt car for it because it was not big I guess and it was hard to clean. My cats wouldn't get in it, as there was slight movement. If a kitten started in this unit and continued with it it would be great.easy to operate, would be better than scooping for sure! My cats are all over 5 years old and were "scardie cats" with this. This litter box has made keeping our kitty’s box clean much easier. It functions as stated in the description. Our kitty started using it immediately without a problem. like the concept, but it just does not work for my cats, they won't use it, unfortunately. "What does recycled black mean?" Hello chichas, the plastic is partially recycled. Thank you for shopping with us! "I use the tidy cats clumping litter, would I be able to continue using that brand of litter? or will I have to change it?" Hello jssr1106, both clumping and non clumping litter works, however clumping litter works the best. You will need to stay away from the extra large litter since it won't sift well. Please let us know if you have additional questions. Thanks for shopping with us. "Is it reasonably large.? I've got 4 cats and 3 of them are bigger than normal. How does it get rid of the solid stuff? Do you use clumping litter?" Hello Catmad, this item is recommended for cat up to 15 pounds. Once this item rolled the solid clumps are disposed in a waste basket that allows for easy dumping. Please watch the video, located by the photos, for a better visual on how this item functions. Thank you for shopping with us. The recommended "15 pounds" is a joke. If you have an adult cat, odds are they won't be able to fit inside and use the litter box. Don't waste your money! Easy to clean and doesn't take up a lot of floor space. "I received the cat litter spinner on 3/4/15. I am not one bit happy with it. It does not rack everything out and I have to try to get in with litter scooper and clean it out. I have read your return policy and. feel it is not working properly or is defective. I wish to return for refund. Please advise. Thank you"
Hello kbradley, you will be contacted by Customer Care. Have a great day. kbradley, it's not just use. This product does not work nearly as well as it's touted too. I'm very disappointed and have learned my lesson about shopping on overstock.com. "How does this box stand up against multiple cats?" Hello kellyhogg, this will hold up just fine against multiple cats; however it may take them some time to get used to it. If you have any additional questions please feel free to let us know. Thank you for shopping with us! "How does this product work, please explain." The Litter Spinner is easy to use. Simply fill the bottom of your litter spinner with 2.5 - 3 inches of your favorite clumping cat litter. When you want to clean your new Litter Spinner just spin one turn, your dirty cat litter is now clean. The cat waste is collected into an easy to empty drawer which is shown to the right of the kitty entrance.